Good morning and Happy Holidays! Keeway here today with this month’s edition of Trending with the Ton. Each month we spot creative, stunning, and fabulous projects featuring products from The Ton, and we love showcasing them here! The first card is absolutely stunning. I love how Chris created this beautiful rose card using our Rose Terrance Background Stamp! What started out as just practice sheets became a gorgeous work of art. The coloring on these rose just look so real! Next, I spotted this cute card made by Kristie that she made for a CAS challenge with the theme “boots.” She beautifully stamped the boots from Shoe Wardrobe 2d. Ed Outline stamps in a eye-catching pattern, and finished it off with a sentiment from our Holiday Lyrics stamps. What virbant, bold color choices! 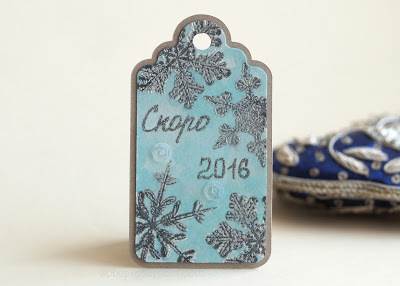 Next up, we found Anna K.’s elegant tag which she created using our Crystal Flurries set. I love the color combination she used with these layered snowflakes! Next, we have Cheryl B.’s card which we found in the Stamping Enabler’s group on Facebook. She used our Wild Peonies and Simple Florals to create a pretty cluster of florals. We also spotted Amy‘s creative holiday coffee card that features the Hug in a Mug stamps, that she stamped on a newsprint background! She chose festive holiday green and red colors and finished the card with a sentiment from our Caffeine Crush set. A perfect card for the holiday season! Next up we have a wonderful video we spotted by Laurel. 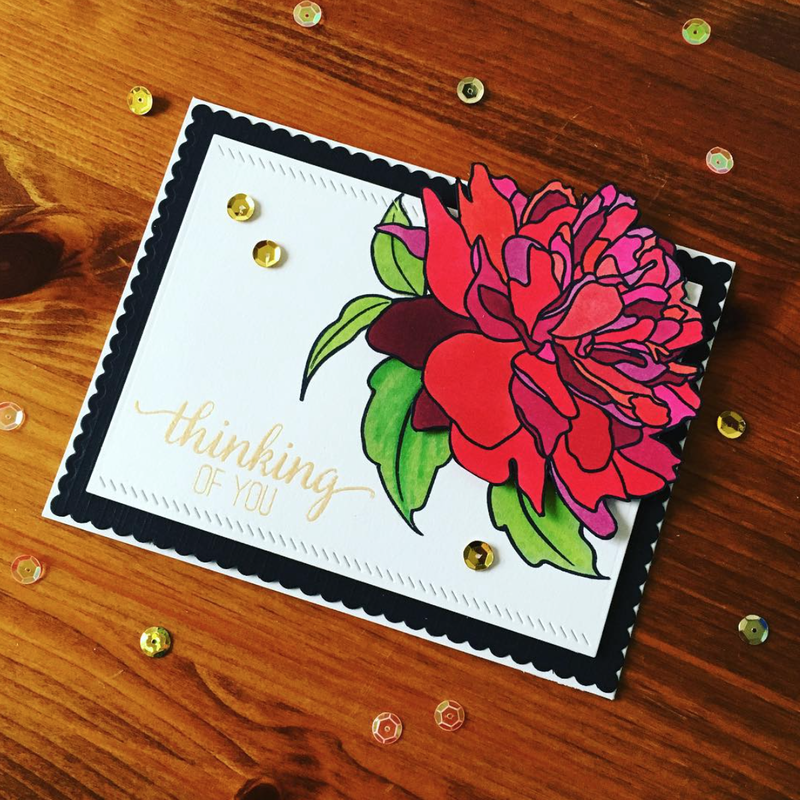 She shares how she utilized our Rose Terrace background stamp to easily create 3 cards all in one application of distress ink. Just wow! She also used sentiments from the Get It Girl and It’s Cray Cray stamp sets. Laurel created more of these in shades of coral in a separate blog post of hers. I can’t get enough of this look! 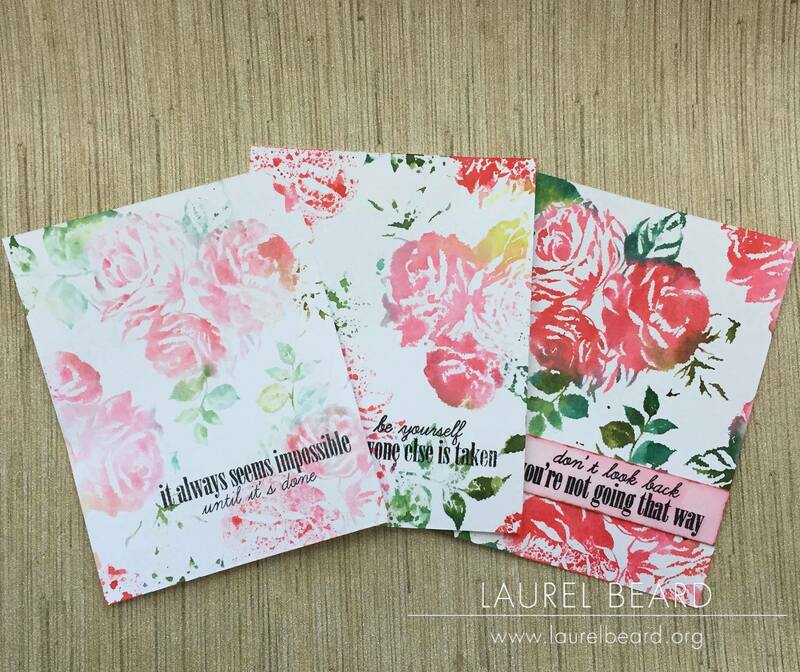 Next, we spotted Laura Jane’s card which she created using our Rose Terrace and Grand Bows set. She created a creative present/gift card using these stamps. How bright and pretty! Next up we have a set of cards created by @michii00 which we found on Instagram. 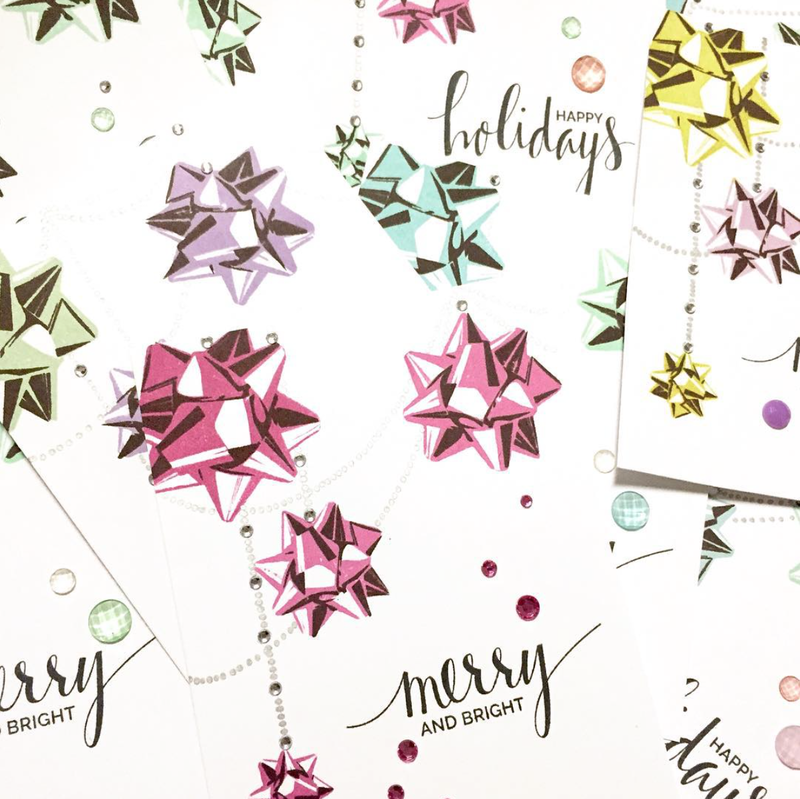 She used our Holiday Bows to create these festive and bright holiday cards. 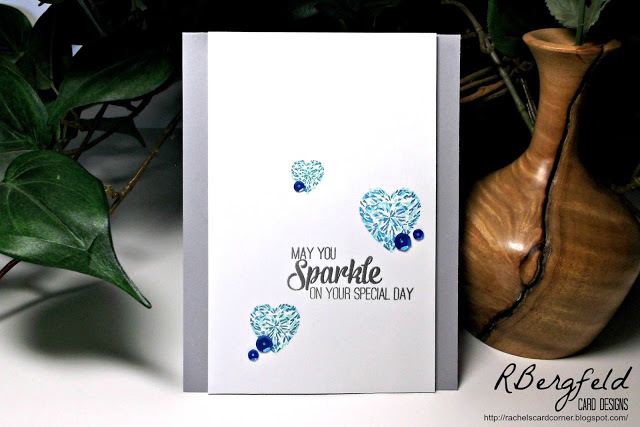 Next we spotted Rachel’s beautiful gem card which she created using our Heart Diamonds set. I love the clean and simple look she created with her composition and choice of bright colors for her gems. Next up is Justin’s card which he created using our Pyrotechnics set. He made this (and two other gorgeous cards) for a class he taught at The Ink Pad. 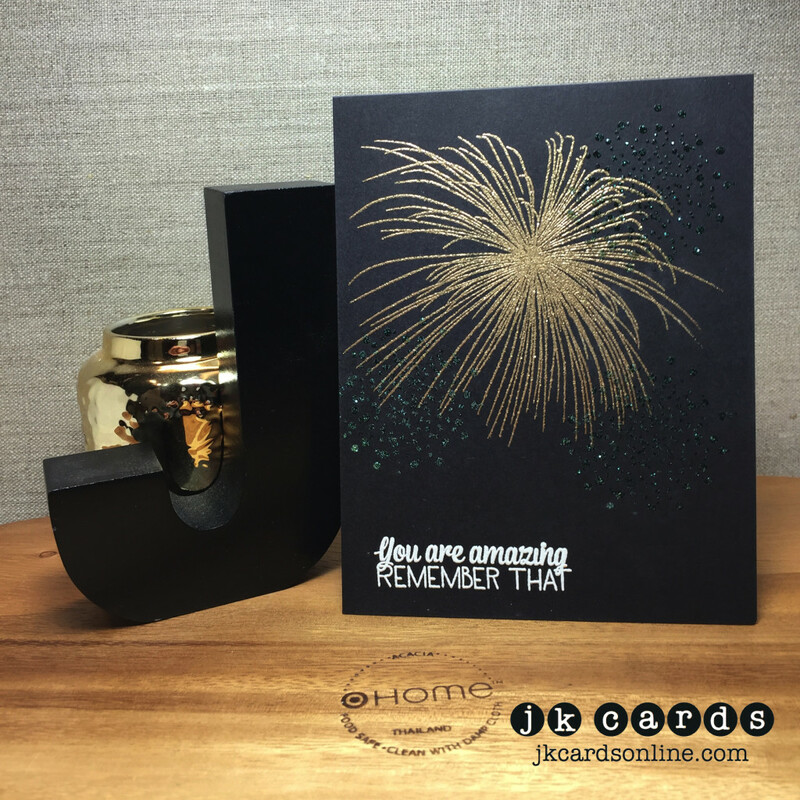 He created a bold look by heat embossing the fireworks on stark black card stock. Last but not least is Erica’s card which we spotted on Instagram. She created a beautiful, bold, graphic look to this project using our Large Peony 2 set. Thank you for using The Ton. You’ve shown us creativity and beauty and left us inspired! We love your support and are always excited to see what amazing and creative projects you come up with, with our stamps. We’re always on the look out! Be sure to tag us when you use our products. Use the hashtags #theton, #thetonstamps, #thetongilding, #thetoncouturecolor on Instagram and other social media sites. We have a Flickr group for you to add your projects to as well as a Pinterest page. Happy crafting! Gorgeous creations by the teamies at The Ton! WOW – I can see why you are all in the CREATIVE SPOTLIGHT!!! Love all these beautiful cards!! The creativity is awesome!